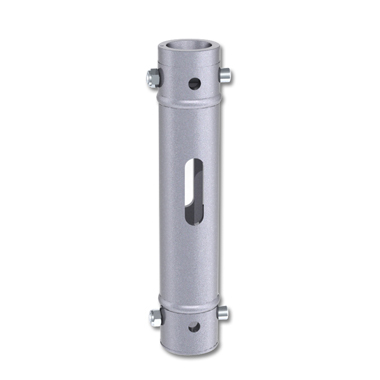 Modular Drop Arm extensions are manufactured from aluminium with a female tapered connector each end. Supplied with two tapered pins, these extensions can be connected together to create a variety of different length drop arms. A slot is provided for a safety bond. Powder painted in silver or satin black modular extensions are available in four sizes 9.84"(250mm), 19.68"(500mm), 39.37"(1000mm) and 78.75"(2000mm).